Dude, look! DK’s ride is for sale! Alright, so, for the sake of the small percentage (I’m assuming) of you who haven’t seen Fast and Furious: Tokyo Drift, let me get you up to speed. The movie’s main antagonist was this guy named Takashi, a real shithead and a nephew of a Japanese mobster. Takashi gained additional street cred and infamy as the king of Tokyo’s underground drifting community. They named him Drift King, or DK, for short (not Donkey Kong). DK would stand around during these drift meets, a scowl on his face, surrounded by admirers. 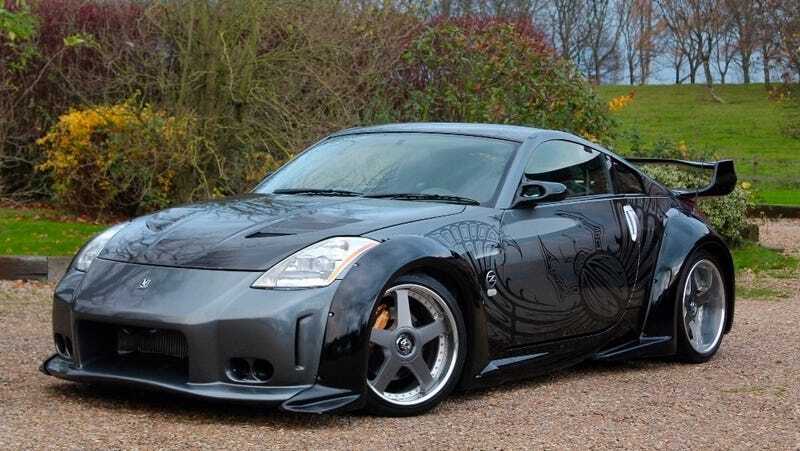 His car was a modified Nissan 350Z, striking with its custom gray-on-black insect paint job that always looked like a sweet tattoo to me. If he needed to, DK would jump into this car and utterly school whoever dared to challenge his authority. And now one of the 350Zs used in the movie is up for grabs! This listing reports that this car is one of two actual cars left from the movie, but the only one built by VeilSide with performance upgrades like a twin-turbo engine. Additionally, it has a VeilSide bodykit, a carbon fiber hood, carbon fiber spoiler, 19-inch alloy weels, Sparco racing seats and more. Unfortunately, the car is for sale in the UK for £99,950 ($140,000), so if I have any friends across the pond...! I want this car because it is my second-favorite car in my most favorite Fast and Furious movie, and also I am convinced that if I get into the driver’s seat, I will be immediately transformed into a drifting god. You really can’t put a price on that.